You are currently browsing the Christian Heilmann blog archives for November, 2016. This morning I gave one of two keynotes at the Internet Days in Stockholm, Sweden. Suffice to say, I felt well chuffed to be presenting at such a prestigious event and opening up for a day that will be closed by an interview with Edward Snowden! Frankly, I freaked out and wanted to do something special. So, instead of doing a “state of the web” talk or some “here is what’s amazing right now”, I thought it would be fun to analyse how the web is doing. As such, I pretended to be a psychiatrist who interviews a slightly depressed internet on the verge of a midlife crisis. The keynote is already available on YouTube. Here is the script, which – of course – I failed to stick to. The bits in strong are my questions, the rest the answers of a slightly depressed internet. Hello again, Internet. How are we doing today? Not good, and I don’t quite know why. It’s not that you feel threatened again, is it? No, no, that’s a thing of the past. It was a bit scary for a while when the tech press gave up on me and everybody talked to those other guys: Apps. But it seems that this is well over. People don’t download apps anymore. I think the reason is that they were too pushy. Deep down, people don’t want to be locked in. They don’t want to have to deal with software issues all the time. A lot of apps felt like very needy Tamagochi – always wanting huge updates and asking for access to all kind of data. Others even flat out told you you’re in the wrong country or the phone you spent $500 on last month is not good enough any longer. No, I really think people are coming back to me. Yes, I suppose. But, I feel bad. I don’t think I make a difference any longer. People see me as a given. They see me as plumbing and aren’t interested in how I work. They don’t see me as someone to talk to and create things with me. They just want to consume what others do. And – much like running clear water – they don’t understand that it isn’t a normal thing for everybody. It is actually a privilege to be able to talk to me freely. And I feel people are not using this privilege. I want to matter, I want to be known as a great person to talk to. It’s funny you say that. I don’t want to, but I have no choice. People keep pushing me into things. Things I never thought I needed to be in. But, surely that must feel good. Change is good, right? Yes, and no. Of course it feels great that people realise I’m flexible enough to power whatever. But there are a few issues with that. First of all, I don’t want to power things that don’t solve issues but are blatant consumerism. When people talk about “internet of things” it is mostly about solving inconveniences of the rich and bored -instead of solving real problems. There are a few things that I love to power. I’m great at monitoring things and telling you if something is prone to breaking before it does. But these are rare. Most things I am pushed into are borderline silly and made to break. Consume more, do less. Constant accumulation of data with no real insight or outcome. Someone wants that data. It doesn’t go back to the owner of the things in most cases – or only a small part of it as a cute graph. I don’t keep that data either. But I get dizzy with the amount of traffic I need to deal with. And the worst is that people connect things to me without considering the consequences. Just lately a lot of these things ganged up on me and took down a large bit of me for a while. The reason was that none of those things ever challenged their owners to set them up properly. A lack of strong passwords allowed a whole army of things that shouldn’t need to communicate much to shout and start a riot. So, you feel misused and not appreciated? Yes, many are bored of how I look now and want me to be flashier than before. It’s all about escaping into an own world. A world that is created for you and can be consumed without effort. I am not like this. I’m here to connect people. To help collaborative work. I want to empower people to communicate on a human level. But, that’s what people do, isn’t it? People create more data than ever. Maybe. Yes, I could be, but I don’t think I am. Sure, people talk to me. People look into cameras and take photos and send them to me. But I don’t get explanations. People don’t describe what they do and they don’t care if they can find it again later. Being first and getting quick likes is more important. It’s just adding more stuff, over and over. So, people talk to you and it is meaningless? You feel like all you get is small talk? I wished it were small. People have no idea how I work and have no empathy for how well connected the people they talk to are. I get huge files that could be small. And they don’t contain any information on what they are. I need to rely on others to find that information for me. When it comes down to it, I am stupid. That’s why I am still around. I am so simple, I can’t break. The ones using me to get information from humans use intelligent systems to try to decipher what it all means. Take the chat systems you talked about. These analyse images and turn them into words. They detect faces, emotions and text. This data goes somewhere, I don’t know where and most of the users don’t care. These systems then mimic human communication and give the recipient intelligent answers to choose from. Isn’t that cool? People use me to communicate with other people and use language created for them by machines. Instead of using us, humans are becoming the transport mechanism for machines to talk to each other and mine data in between. This applies to almost all content on the web – it is crazy. Algorithms write the news feeds; not humans. Speed. Constant change. Always new, always more, always more optimised. People don’t take time to verify things. It sickens me. You’re right, I shouldn’t be bothered. But I don’t feel good. I feel slow and sluggish. Take a tweet. 140 letters, right? Loading a URL that is a tweet on a computer downloads 3 megabytes of code. I feel – let’s name it – fat. I want to talk to everybody, but I am fed too much extra sugar and digital carbs. Most of the new people who are eager to meet me will never get me. This is because this company want to give users their site functionality as soon as possible. But it feels more sinister to me. It is not about using me, it is about replacing me and keeping people inside of one system. I am meant to be a loosely connected network of on-demand solutions. These used to be small, not a whopping 3 Megabytes to read 140 characters. People still don’t get that about me. Maybe it is because I got two fathers and no mother. Some people get angry about this and don’t understand it. Maybe a woman’s touch would have made a better system. But the worst is that I am almost in my 30s and I still haven’t got an income. There seems to be no way to make money with me. All everybody does is show ads for products and services people may or may not buy. Ask for money to access something on me and people will not use it. Or find an illegal copy of the same thing. We raised a whole generation of people who don’t understand that creating on me is free, but not everything that I show is free to use and to consume. Ads are making me sick and obese. Many of them don’t stop at showing people products. They spy on the people who use me, mine how they interact with things and sell that data to others. In the past, only people who use me for criminal purposes did that. Blackmail and such. Can’t you do anything about that? I can’t, but some people try. There’s ad blockers, new browsers that remove ads and proxy services. But to me these are just laxatives. I still need to consume the whole lot and then I need to get rid of it again. That’s not a healthy way to lose weight. Some of them have nasty side effects, as you never know who watches the watchmen. What do you need to feel better? I want to communicate with humans again. I want to see real content, human interactions and real emotions. I don’t want to have predictable creativity and quick chuckles. I want people to use me for what I was meant to do – real communication and creativity. Yes, you said that. What’s stopping you? Two kinds of people. The ones who know my weaknesses and use me to attack others and bully them. This makes me really sick, and I find it disappointing that those who act out of malice are better at using me than others. The second kind of people are those who don’t care. They have me, but they don’t understand that I could bring prosperity, information and creativity to everyone on the planet. I need to lose some weight and I need to be more open to everybody out there again. Not dependent on a shiny and well-connected consumption device. So, you’re stuck in between bullies and sheep? Your words. Not mine. I like people. Some of my best friends are people. I want to keep empowering them. However, if we don’t act now, those who always tried to control me will have won. Not because they are good at it, but because the intelligent, kind and good people of the web allowed the hooligans to take over. And that allows those who want to censor and limit me to do so in the name of “security”. I am. We all should be. This is not a time to be silent. This is not a time to behave. This is a time that needs rebels. People who use their words, their kindness and their willingness to teach others the benefits of using me rather than consuming through me. Hey, maybe there are quite a few here who listened to me and help me get fit and happy again. The feedback so far was amazing. People loved the idea and I had a whole day of interviews, chats, podcasts and more. Tomorrow will be fun, too, I am sure. 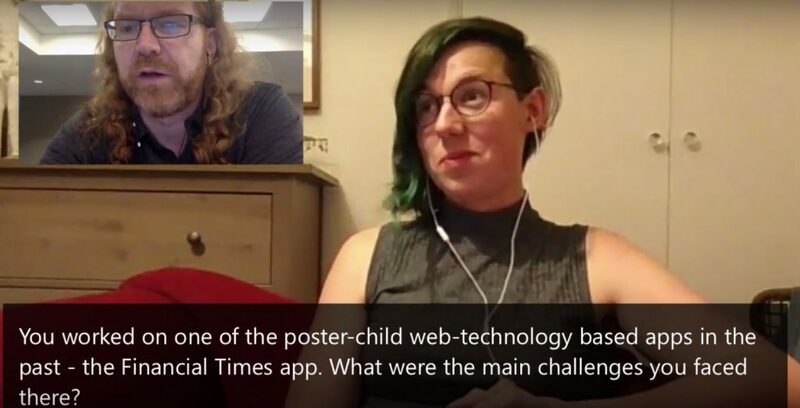 A few weeks after I pestered Ada Rose Edwards to write her first Smashing Magazine article on Progressive Web Apps I did a Skype call with her to talk about the same topic. Ada is a great talent in our market and I am looking forward to pestering her to do more of these good things. Ada, you just wrote on Smashing Magazine about “The building blocks of progressive web apps”. Can you give a quick repeat on what they are? We’ve had a few attempts at using web technology to build app like experiences. A lot of them left end users disappointed. What do you think were the main mistakes developers did? Is the “app shell” model a viable one or is this against the idea of “content first” web sites turning into apps? You worked on one of the poster-child web-technology based apps in the past – the Financial Times app. What were the main challenges you faced there? It seems that in the mobile space it is OK to abandon platforms that arent’ used much any longer, should that be something to consider for the web and browsers, too? Progressive Web apps do away with the concept of a need of an app store. This is more convenient, but it also poses a UX challenge. Users aren’t expecting a web site to work offline. What can we do to break that assumption? The wonderful thing about PWAs is that they are progressive, which means that platforms that don’t support ServiceWorkers should still have a good experience and fall back to a classic “add to homescreen” scenario. What can we do to avoid people forgetting about this and build “this app needs Chrome on latest Android” apps instead? Are responsive interfaces a unique skill of web developers? Is it something we learned simply because of the nature of the platform? The distribution model of PWAs is the hyperlink. You pointed out rightfully in your article that there needs to be a way to share this link and send it to others. Hardliners of the web also argue that a URL should be visible and “hackable”. Do you think this is a valid need? What about Instant Apps on Android? Aren’t they a threat to Progressive Web Apps? What can we do to avoid PWAs becoming the new “m.example.com”? The average web site it too big and slow to become and app. 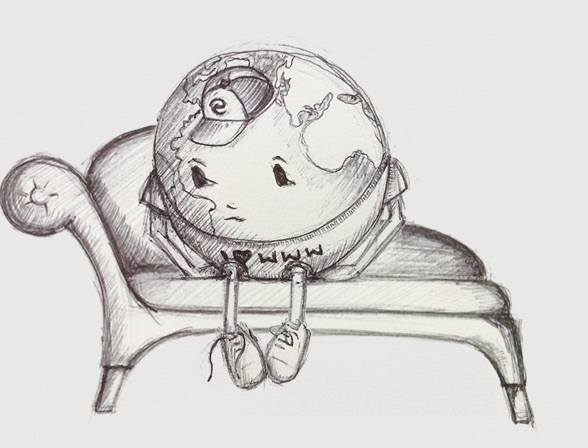 How high are your hopes that this new approach could help the web as a whole become slimmer? The original plan at the first evening of this year’s Øredev was for me to interview Peter Sunde about the history of Pirate Bay as covered in his SmashingConf Barcelona “Technology Is Neither Good Nor Bad — You Are” talk. As Peter couldn’t come and the massive news of the US or the voting system choosing Donald Trump as the president I quickly changed my plans. Instead, I wrote a talk explaining the very random way I got to become a professional developer and that it is our duty as privileged people now to share our knowledge with those not as lucky. After the talk I invited a very distraught Rob Conery, author of The Imposter’s Handbook to help share some cheerful and amusing anectodes in his history. We ended up with some actionable ideas how to learn more and not listen to the inner voice that keeps telling us we’re not good enough. The slides of the talk are on Slideshare. The more people do this, the more best practices can be shared. We have the privilege of open tools, an open platform and openly available documentation. You don’t need to start from scratch – you can contribute to thousands of existing projects – many aimed to teach people how to become a web maker. You don’t even need to code. You can help with UX, or document, or herd communities. If you feel down and “not good enough”, create something – anything! The web is the most versatile and non-elite platform. Go and make your mark! At SmashingConf Freiburg I took some time to interview Sarah Drasner on SVG. In this interview we covered what SVG can bring, how to use it sensibly and what pitfalls to avoid. Sarah is a dear friend and a lovely person and knows a lot about animation and SVG. SVG used to be a major “this is the future of the web” and then it vanished for a while. What is the reason of the new interest in a format that old? Tooling in SVG seems to be still lagging behind in what Flash gave us. Are there any good tools that have – for example – a full animation timeline? SVG syntax on first glance seems rather complex due to its XML format and lots of shortcut notations. Or is it just a matter of getting used to it? Coordinate systems seem to be easy to understand, however when it comes to dynamic coordinate systems and vector basics people get lost much easier. When you teach, is this an issue? What about prejudices towards SVG? It is rumoured to be slow and very memory intense. Is this true? Presets of tools seem to result in really large SVG files which is why we need extra tools to optimise them. Is this improving with the new-found interest in SVG? There are security issues with linking to external SVG files which makes them harder to use than – for example – images. This can be discouraging and scary for implementers, what can we do there? 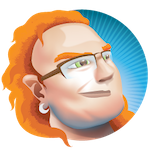 Does SVG live in the uncanny valley between development and design? Is there one thing you’d love people to stop saying about SVG as it is not true but keeps coming up in conversations? 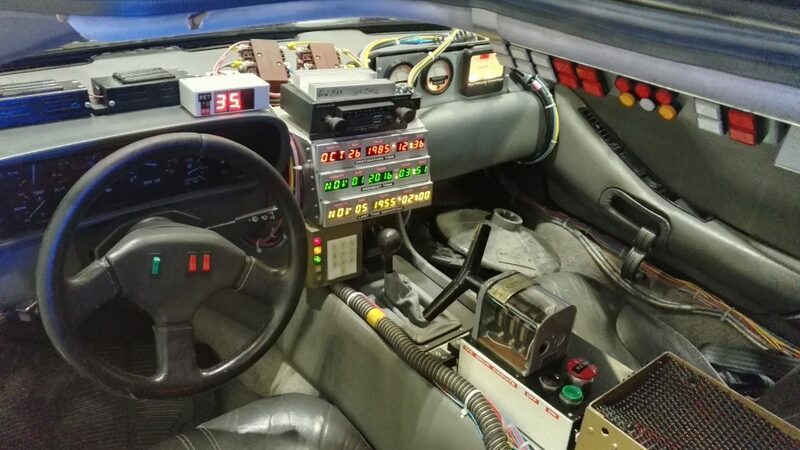 Yesterday I went to the Excel in London for Future Decoded to learn a lot about the future of technology, finally see the DeLorian from Back to the Future and give a talk. I covered Machine Learning, its ethics, its effects on the job market and what we as developers need to do to make Artificial Intelligence work for rather than against humans. I will repeat this talk slightly amended and more about the ethics and ideas as the Friday Keynote of the upcoming Øredev Conference in Malmø so see you there?